The Democracy Monument (Thai: อนุสาวรีย์ประชาธิปไตย Anusawari Prachathipatai) is a public monument in the centre of Bangkok, capital of Thailand. It occupies a traffic circle on the wide east-west Ratchadamnoen Klang Road, at the intersection of Dinso Road. The monument is roughly halfway between Sanam Luang, the former royal cremation ground in front of Wat Phra Kaew, and the temple of the Golden Mount (Phu Kao Thong). The monument was commissioned in 1939 to commemorate the 1932 Siamese coup d'état (also called "Siamese Revolution of 1932" or just "1932 Revolution") which led to the establishment of a constitutional monarchy in what was then the Kingdom of Siam, by its military ruler, Field Marshal Plaek Phibunsongkhram. 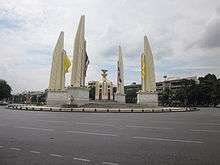 Phibun saw the monument as the centre of what he envisaged as a new, Westernised Bangkok, "making Thanon [road] Ratchadamnoen the Champs-Élysées and the Democracy Monument the Arc de Triomphe" of Bangkok. The monument was designed by Maeo Aphaiyawong, an architect whose brother, Khuang Aphaiyawong, was a leading member of Phibun's government. The Italian sculptor Corrado Feroci, who became a Thai citizen and used the Thai name Silpa Bhirasi from the Second World War on, initially to avoid Japanese military ire, executed the relief sculptures around the base of the monument. He also provided the main sculpting for the renowned Lady Mo monument in the northeast Thailand city of Nakhon Ratchasima. The building of the monument was highly unpopular at the time. Local residents and shopkeepers (mostly Chinese) were evicted from their homes and businesses with 60 days' notice. The widening of Ratchadamnoen Road to create a ceremonial boulevard involved cutting down hundreds of shade trees, a serious matter in the days before air conditioning, given Bangkok's torrid climate. The centrepiece of the monument (Figure 1 below) is a carved representation of a palm-leaf manuscript box holding the Thai Constitution of 1932, on top of two golden offering bowls above a round turret. The constitution is symbolically guarded by four wing-like structures (Figure 2 below), representing the four branches of the Thai armed forces—army, navy, air force and police—which carried out the 1932 coup. The wings are 24 metres high, and this is also the radius of the base of the monument, marking the fact that the 1932 coup took place on 24 June. The central turret is three metres high, representing the month of June, which is the third month of the traditional Thai calendar. There were originally 75 small cannon around the outer ring of the monument, representing the year of the coup, 2475 in the Buddhist calendar. The six gates of the turret represent the six proclaimed policies of the Phibun regime: "independence, internal peace, equality, freedom, economy, and education." The relief sculptures at the base of the monument are propagandistic in their design. They depict the armed forces both as champions of democracy and as the personification of the Thai people. In the version of events depicted in these sculptures, the coup of 1932 was carried out by a united and idealistic Thai armed forces on behalf of the people, and had both the intention and effect of making Thailand a democracy. In the reliefs, civilians appear only as the grateful recipients of the heroism and benevolence of the armed forces. The panel titled "Soldiers Fighting for Democracy" (Figure 4 below), shows a heroic and united armed forces doing battle (it is not clear against whom) for "democracy". The panel titled "Personification of the People" (Figure 5 below), shows a soldier protecting the Thai people while they go about their civil pursuits. The mother with child at left is the only woman depicted anywhere at the Democracy Monument. The panel represents the view of the military regime in 1939 that the armed forces were ruling on behalf of the people. The panel titled "Personification of Balance and Good Life" (Figure 6 below), represents the social ideology of the military regime. An allegorical figure representing the nation, seated in a Buddha-like posture (but not Buddha himself), holding a sword and a set of scales, representing the armed forces and justice respectively, sits in the centre, flanked by figures representing (from left) sport, education, religion, and the arts. The figure of "sport", a naked man with a shot put, is wholly European in origin. Figure 1: A representation of box holding the Thai Constitution of 1932 sits on top of two golden offering bowls above a round turret. Figure 2: One of the four wing-like structures which guard the Constitution, representing the four branches of the Thai armed forces. Figure 3: One of the naga fountains at the base of two of the wing structures. Figure 4: Sculptural panel titled "Soldiers Fighting for Democracy"
Figure 5: Sculptural panel titled "Personification of the People"
Figure 6: Sculptural panel titled "Personification of Balance and Good Life"
The story represented by these sculptures was a considerable distortion of the truth. In fact the 1932 coup was planned and executed almost without bloodshed by a small group of officers and some civilian collaborators, while the king was on holiday at the seaside (see History of Thailand (1768-1932)). The coup was followed by the promulgation of Thailand's first constitution, but this was far from fully democratic. In the mid-1930s there was an attempt to progress to full democracy, but this broke down amid a split between the military and civilian elements of the government, and by 1939, when the Democracy Monument was built, Thailand was in effect a military dictatorship. The most striking absence from the iconography of the Monument is the monarchy, which today is at the centre of Thai national life and political culture. The fact that the 1932 coup was staged against King Prajadhipok (Rama VII), uncle of the present King, and that he went into exile and eventually abdicated rather than accept the country's degeneration into a military dictatorship, is today seldom mentioned. Although the military regime paid lip service to the monarchy, its political ideology (an ultimately incompatible mix of European liberal constitutionalism and military Bonapartism) was essentially republican. Prajadhipok's successor, Ananda Mahidol (Rama VIII) was at the time a schoolboy in Switzerland. Now that Thailand is (ostensibly) a democracy, very few Thais are aware of the propaganda content of the sculptural works at the base of the Democracy Monument; because the enormous growth in the volume of Bangkok's traffic, and the fact that pedestrian access to the traffic island on which it stands is all but impossible during periods of heavy traffic, it is difficult to observe the details of the Monument up close. There are now plans to build a tunnel under the roadway to allow better access (as has been done at the Berlin Victory Column, which is similarly located). Despite the self-justifying intent of the Phibun regime in erecting a monument to its own seizure of power and calling it a monument to democracy, Democracy Monument's rather dubious origins are now largely forgotten, and it has served as a rallying point for later generations of democracy activists. It was the focus of the mass student demonstrations against a later military regime in 1973, and of the protests that triggered the 1976 military coup. In 1992 scores of Thais were killed as they protested at the monument against General Suchinda Kraprayoon's regime. These events have given the monument a legitimacy it lacked for much of its history.